Our modern classic single bowl raised dog feeder, the Moretti diner, sets the standard for all urban chic dog feeders. The pet feeder is classic enough to be used with most decors. Heavy duty, beautifully constructed, available in 3 sizes. 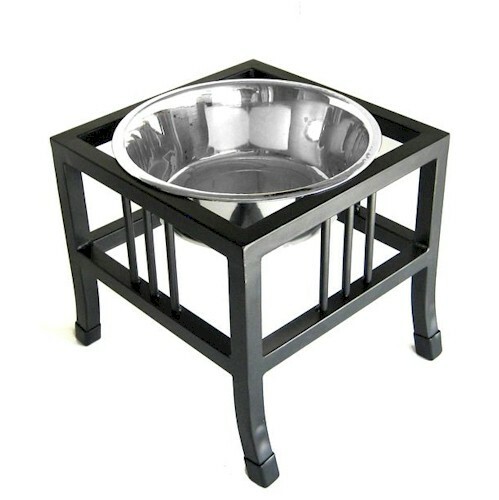 The raised single diner dog bowl feeder comes with non-skid plastic tips on legs. The Moretti diner is a sturdy elevated design, great for your pet's health and greatly minimizes the stress on his/her neck, back, and joints. Elevated feeders also aid in your pet's digestion and reduces gas because your pet no longer needs to slouch to eat or drink.